In this drawing, the proposed Hood Park — including a 295-foot tower — is seen from Rutherford Avenue. Developers are pushing ahead with revamped plans for the Hood Park complex on Rutherford Avenue in Charlestown, with the goal of turning the old dairy complex into a high-tech office hub. The park’s longtime owner has filed plans for six new buildings in the 20-acre business park, updating a development proposal that’s nearly two decades old with plans for taller structures and more open space. 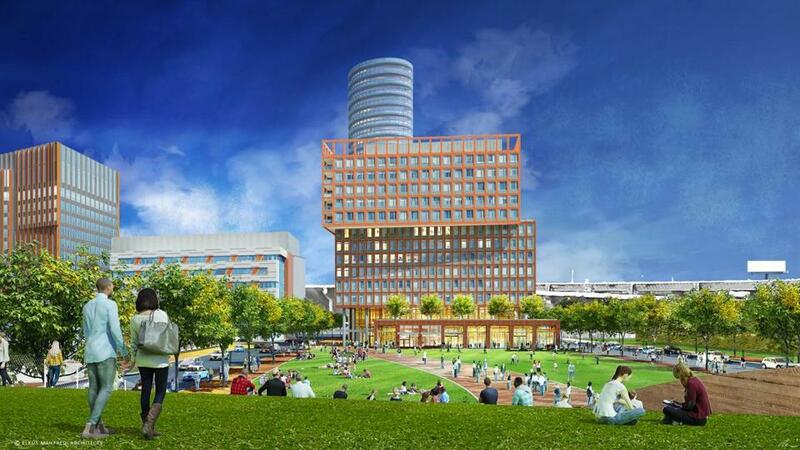 It wants to put four new buildings full of office and lab space along the Interstate 93 side of the park, with one reaching 24 stories and 295 feet high. The plans also calls for adding a hotel and roughly 200 more units of housing, and creating a one-acre park stretching across the campus to Rutherford Avenue. The park’s low-slung main building, which has recently been renovated for use as office space, would remain in place, as would other new buildings such as an apartment building currently under construction. It’s the latest version of a master plan approved in 2000, with 1.8 million square feet of space across 11 buildings, updated to reflect the needs of modern tenants, said Chris Kaneb, manager of Hood Park LLC, which owns the campus. While Kaneb and others in recent months have been meeting with neighborhood groups about the project, the plans filed Friday will trigger months of formal community meetings and a review by the Boston Planning & Development Agency.